Professional letting agents help landlords to save an average of almost £2,000 a year in comparison with landlords who go it alone. A new study found the average landlord is £1,910 per year better off as a result of utilising the services of a reputable agent, with higher rental income and fewer void periods among the advantages of doing so. While landlords who do not use a letting agent save an average of £159 on fees each month, missing out on rent and experiencing longer voids means they fail to maximise the potential of their investment property. Allison Thompson, managing director at property specialist Leaders, says: “There is a misconception among some landlords that a successful letting agent will not add value to your investment. This is not true, as the figures show landlords who work with an agent enjoy a significantly higher return. “The marketing power of an established agent gives your property the best chance of being rented by a quality tenant as soon as it goes on the market. Some DIY landlords understandably struggle to bring a home to the attention of prospective tenants and suffer lengthy and costly voids as a result. Indeed, peace of mind was found by the Endsleigh survey to be a significant benefit of working with a letting agent, with 41 per cent of landlords naming it as the number one perk. 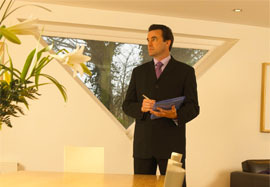 A further 50 per cent suggested they are most attracted to an agent by their local knowledge. For more information or advice on letting a property, contact your local Leaders branch today.